The greatest challenge of doing business online is: knowing what readers’ actually want. I’m sure you’ve read several articles and post on how to build a profitable blog, and I’m not going to bore you with such theories. A few work actually, but others don’t. Period! And that’s not the goal of writing this post. Blog readers are valuable assets and if you can solve a particular problem bugging their minds, you would generate better sales lead, sell affiliate programs easily and build strong blogging system that can sustain you for years. Why do people read blog posts? You run a blog and consistently update it with fresh contents, but have you ever sat down to ponder on the ‘essence of blogging?’ If a 2-year old boy should throw the question at you, what would your response be – why do people read blog posts? Believe me, there are countless reasons, but the most powerful, common but often neglected reason is this: “A reader is looking for a proven answer!” If a blog isn’t helping the reader achieve her business goals, or draw closer to it, why waste money on web hosting and other subscription-base services? You see, it’s not enough to have thousands of readers on your blog, it has to be more than that – this people have blood running through their veins, they have a need and just like you, they want to make more money, live healthy, generate better leads, reach new horizon, pay off debts, invest wisely et al. A Good Intention Isn’t Enough! I know you’ve good intentions to solve problems, deliver top notch services and impact lives around the world – all well, but it doesn’t matter, because every business entrepreneur and blogger have similar intentions. What you do with your intentions and how it translates into tangible results is KEY! But the problem is, you can’t help somebody, if you don’t know the problem they have. And like I said earlier, I don’t have 10 tips to help you find out, but I know of one that’s fabulous. It doesn’t fail and if you give it a BIG shot, get ready for ‘good success’ in your blog. Caution: Can You handle It? 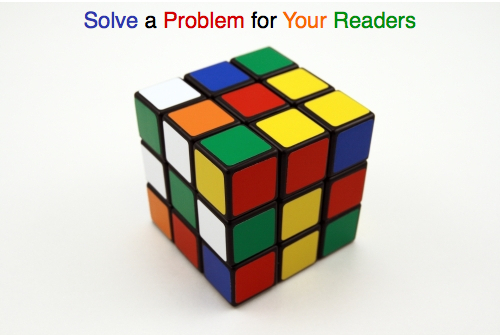 What problem is your reader currently facing? Hmm! How do you know the mind of Guy Kawasaki, Brian Clark, Pat Flynn, Darren Rowse and the like? You don’t have to visit their homes and spent time with them, nor engage in argument with them (if you are bold enough). Guess what? It’s pretty easy for anyone to know what these experts have in mind at all times. Read their books, spend time on their blog posts, study their whitepapers, interviews them, watch their video clips, listen to their podcasts and whatever you can lay your hands upon. Here’s a shock: Every person on earth is ‘glued’ to her words. As you read this, you can gauge my knowledge about blogging, engagement and business. Writing blog post should not be based on mere assumptions, read previous comments and listen to the voice behind the words and sentences. A lot of bloggers do not have time to study comments, but that’s where the greatest ‘marketing discovery’ is hid. I’ve delivered on what I promised in this post. Now, you know. Spent more time listening to readers via comments they have made on previous posts. Do the comments sound desperate, confident or beggarly – only you can tell – but not until you read what they’ve written. Wait, is there another way to understand your reader, and impact their lives? Share your comments and link back to this post. Thanks a bunch and see you at the top!